Rabbi and rabbanit Edery detail the historic appointment, and explain how a tragic tsunami led to a spiritual opening. Israel and Japan have been becoming key allies in the span of just over a year, and that growing bond connecting the two countries located on either extreme of Asia was given a further historic seal in recent weeks in the appointment of Japan's first-ever chief rabbi. Arutz Sheva got the opportunity to speak with Rabbi Binyamin Edery, the head of Tokyo's Chabad House and Japan's new chief rabbi as appointed by the Japanese legislative body, the Diet. The rabbi arrived in the Land of the Rising Sun back in 1999 to establish Japan's first Chabad House. From his base in the sprawling metropolis of Tokyo he devotes his time to helping all people, both strengthening the Jewish identity of Jews living or visiting in Japan, and also teaching the Seven Noahide Laws to non-Jews and thereby bringing them closer to G-d. The same year the pioneering rabbi arrived in Japan, he established the first kosher certification agency in the country, called Kosher Japan or KJ. 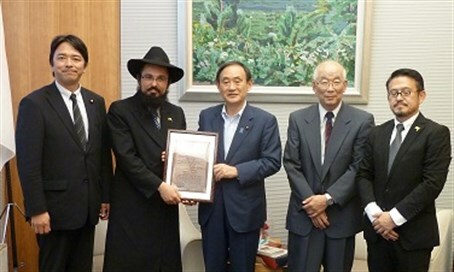 In recognition of his important role, the Israeli Chief Rabbinate appointed Rabbi Edery as Chief Rabbi of Japan back in 2012, with an appointment letter signed by numerous top rabbis worldwide including Chief Sephardic Rabbi Yitzhak Yosef, Jerusalem Chief Rabbi Shlomo Amar, Rabbi Yaacov Schwei of the top Jewish court in Brooklyn, NY, and many others. Japan's government postponed officially appointing him as chief rabbi for various internal reasons, but this June the appointment was finally made official. On June 25, Rabbi Edery was invited to the office of Japanese Prime Minister Shinzo Abe for a special meeting. The prime minister's secretary Yoshihide Suga made the invitation, thanking him for his actions helping local Japanese during the horrific Tohoku tsunami and nuclear disaster in 2011 that killed over 15,000 people. The meeting was arranged by parliamentarian Kazuya Shimba of the Diet, who studied in Jerusalem's Hebrew University from 1991 to 1992 and served as deputy defense minister from 2010 to 2011. It was also organized by Dr. Y.Yuro Teshima, who likewise studied at the university in Jerusalem back in 1967 and was a student of Rabbi Avraham Yehoshua Heshel, and who currently gives regular introductory courses on Judaism at the Chabad House in Tokyo. Rabbi Edery's unprecedented appointment was welcomed by his Chabad House, which said it aims to be "a lighthouse of goodness and kindness illuminating the spiritual desert of Japan till the coming of Moshiach (Messiah - ed.)." Efrat Edery, the rabbi's wife, explained to Arutz Sheva that a main reason behind the decision of both the rabbinate and the Japanese government to select Rabbi Edery was because of his "selflessness during and after the Tsunami both to Jews and non Jews." She recalled how the rabbi held a large Purim meal and Pesach seder for Jews left in Tokyo and Jews who survived the tsunami area, noting how those who took part were moved at his dedication to stay with his family and support the local Jewish community, despite the dangers. He also led the efforts to help Japanese surviving the wreckage, sending truckloads of clothes and food to be distributed to people forced to sleep in city halls in the area of the disaster after their homes were ruined. In recognition, "the Japanese government gave Rabbi Edery and his family Permanent Resident status, which is very difficult to receive as a foreigner who does not have a high monthly salary so as not to impose upon the public." The government said the status was given since the rabbi proved he is such an asset to Japanese society, his wife recalled.